Now that we’re in the month of April, members of Asbury University’s Alumni Office are all too aware that the annual Reunion celebration is just around the corner. With just more than two months left to prepare and plan, excitement is building in anticipation of welcoming back former students who once called Asbury home. For some of the alumni visiting this upcoming June, this Reunion is particularly special and something that shouldn’t be missed. The Knight Class of 1969 will gather together to celebrate its 50th reunion, a major milestone on the members’ collective timelines. 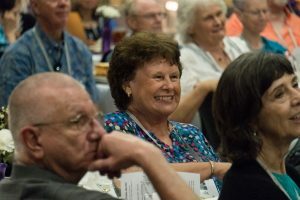 Class members will have the opportunity to reconnect and reminisce about their formative years with old friends throughout the course of Reunion weekend. Those from the Class of 1969 will get to share in a class dinner together on Thursday, June 20 at 5:30 p.m. in the Wilmore Free Methodist Church. The class will have two other specific opportunities for fellowship as well, with class lunches scheduled on Friday and Saturday. Lisa Falin ’90 Harper, director of the Alumni Office, is excited to bring 50-year students back to campus. The committee has already met on several occasions in preparation for June’s upcoming festivities. The theme of Reunion this year is “He Is Faithful,” a motif chosen specially by the Alumni Office. Though the Alumni Office is excited to welcome the Class of 1969 back to campus, all former Asbury students are invited to return and celebrate fellowship with one another. While the highlight years (class years ending in 4 and 9) will have specific events tailored for them, Reunion weekend is designed to bring fun and friendship to all attendees. Asbury’s 2019 Reunion is scheduled for June 20-June 23. To learn more and to register for Reunion, visit www.asbury.edu/reunion/.